Kadoo is a new online service that helps you share your file with friends easily. As many other online sharing sites, Kadoo is a free service but offers much bigger than other up to 10GB space, you can upload your stuff, photos, videos, files. Kadoo also focus online communication, it is not only an online storage place, it also lets you communicate with other people. You have a main web page, you can look for other users, invite or join other people for share files. I think it is similar with another site Multiply but still has own features. 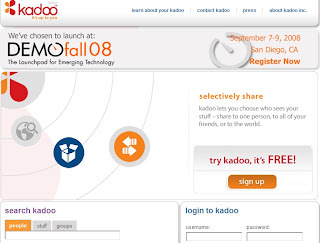 Now, Kadoo is not open to public, you need an invitation that allows you register. If you are interesting about it you can grab this invite code: therapeuticbusiness. Have fun!